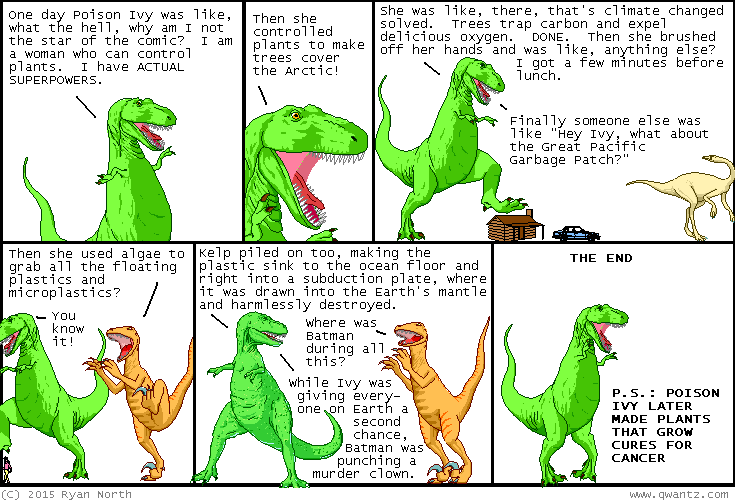 Dinosaur Comics - November 16th, 2015 - awesome fun times! November 16th, 2015: This, combined with my other Poison Ivy comic, is basically just me documenting how she is going to be the hero of the DC Universe. It'll be amazing, I PROMISE. UPDATE: I have heard some concerns that making the Arctic green would mean it would reflect less light, which would in turn increase the planet's temperature. Lucky for US that Ivy invented white plants that still absorb sunlight! She is extremely talented and we should all stop worrying about it. One year ago today: Not that I loved Twitter less, but that I loved Facebook more.